Estenson Racing's Jake Johnson (5) and Kolby Carlile (136) in action at the Daytona TT. Photo by Andrea Wilson, courtesy of Estenson Racing. PHOENIX (March 21, 2018) – The Estenson Racing team heads to the Atlanta Short Track with a triple threat in the AFT Twins class – Jake Johnson, JD Beach and Kolby Carlile – for round two of American Flat Track, Saturday, March 23, at Dixie Speedway in Woodstock, Georgia. 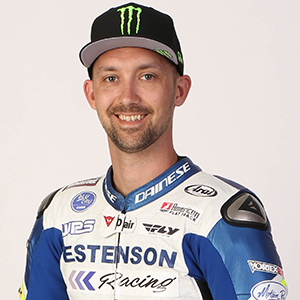 The first oval race of the season will present a different challenge than the season opener was at the Daytona TT for the all-new Estenson Racing Yamaha MT-07 DT. However, the team spent time in the winter testing on similar clay short tracks, so everyone’s looking forward to seeing where they stack up against a competitive field in the premier class. Starting with Johnson, who is fresh off of his podium finish in Daytona. It was a solid start for the new machine and the two-time Grand National Champion. 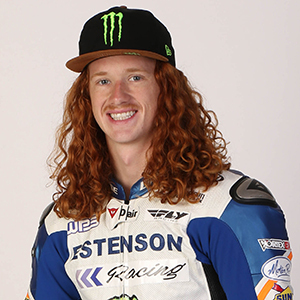 The veteran on the team is well aware that Daytona brings so many unknown factors – the track, first race jitters, etc. – and he is eager to race at Dixie Speedway, and hopefully make a return trip to the podium. After a tough start in Daytona missing the Main due to a first turn crash in his Semi, his teammate Beach is really looking forward to another go this weekend in Woodstock. Last year, Beach got off to a great start and was fastest in qualifying. He went on to have a decent finish in his Heat in sixth, but unfortunately weather put a halt to racing action that Saturday night. When racing resumed Sunday during the day, the track had changed and unfortunately Beach did not advance to the Main due to a flat tire. This year, Beach is on a new bike and with a new team and is looking for better. Their teammate Carlile is also eager to get back to racing. Although his night in Daytona ended early with a mechanical, the rookie had an impressive showing, running among the top five in the Main. Although the Daytona TT is completely different from the clay Short Track, Carlile comes into the race with confidence and is looking to build on his forward progress. 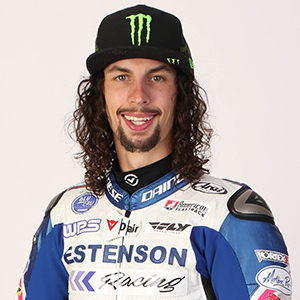 “After the day that I had at Daytona, I can’t wait to get back on the bike and race again. It definitely didn’t go the way I had hoped, so I’m really looking forward to Atlanta. Going into this first race on an oval, I’m excited. It’s a track that I really enjoyed last year, but towards the end of the day, we struggled a bit when the track changed. “Coming off a debut race like we had in Daytona has definitely given me an extra push this week to train a little harder, and it just has me excited for what the future can hold. I am in love with how my MT-07 DT is handling and working. The Atlanta Short Track will be streamed live, Thursday, March 23, on FansChoice.TV starting with practice at 3:00 p.m. ET, followed by the Heat races at 5:30 p.m. ET. Opening Ceremonies kick off at 7:00 p.m. ET, with Semis at 7:15 p.m. ET and the Main Events at 8:00 p.m. ET. Catch the race on NBCSN, March 31 at 4:30 p.m. ET. For tickets and additional information about the event: http://www.americanflattrack.com/events/ .